Character occurrence in passwords | Why? 93% of passwords were between 6 and 10 characters. In this post, we will investigate the remaining 32,000 passwords that passed the dictionary attack. As Troy points out, the vast majority of passwords only contained a single type, i.e. all lower or all upper case. 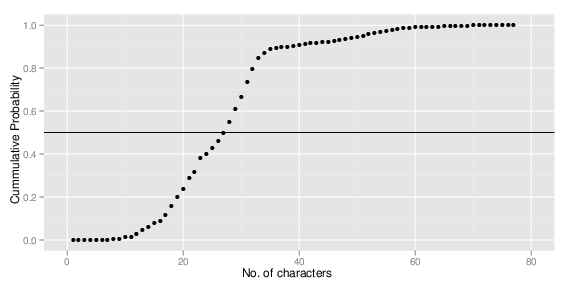 However, it turns out that things get even worst when we look at character frequency. In the password database, there are a 78 unique characters. 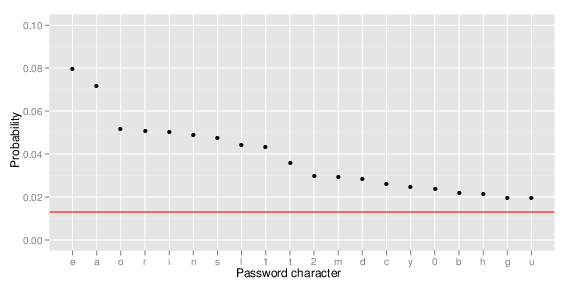 So if passwords were truly random, each character should occur with probability 1/78 = 0.013. However when we calculate the actual password occurrence, we see that it clearly isn’t random. 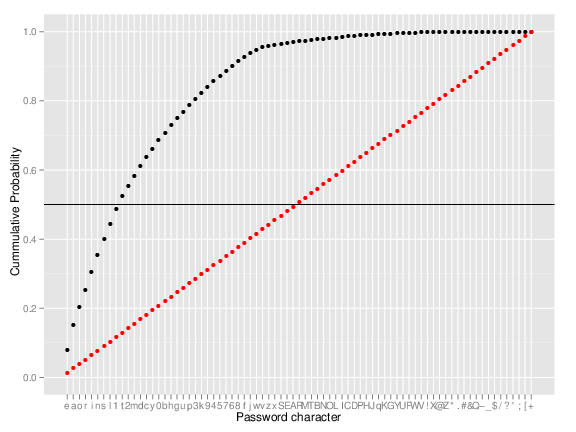 The following figure shows the top 20 password characters, with the red line indicting 1/78. Clearly, things aren’t as random as we would like. So in around of 84% of passwords that contain the number “1”, the number appears only in the second half of the password. Clearly, people like sticking a number “1” towards the end of their password. We see similar patterns with other alpha-numeric characters. To cover 50% of passwords in all list, we only need to use the first 27 characters. In fact, using only 20 characters covers around 25% of passwords, while using 31 characters covers 80% of passwords. Remember, these passwords passed the dictionary attack. Typically when we calculate the probability of guessing a password, we assume that each character is equally likely to be chosen, i.e. the probability of choosing “e” is the same as choosing “Z”. This is clearly false. Also, since many systems now force people to have different character types in their password, it is too easy for users just to tack on a number as their final digit. I don’t want to go into how to efficiently explore “password space”, but it’s clear that a brute force search isn’t the way to go. Personally, I’ve abandoned trying to remember passwords a long time ago, and just use a password manager. For example, my wordpress password is over 12 characters and consists of a completely random mixture of alphanumeric and special characters. Of course, you just need to make sure your password manager is secure…. Great analysis! I guess it could be used to build a pragmatically “optimised” password generator. I now just use a password manager to keep track of very long and random passwords. The number of sites that require a username and password seems to increase by one every day! More likely to be used in new password crack software. This is a really nice analysis. I like the use of cumulative probability plot and the fact that 25% of the (remaining) passwords consist only of the most popular 20 characters. A quick search for “letter frequency” in the English language suggests there are minor differences between the letter distribution, but nothing too significant. That’s not true at all. We know that hackers will always use any data available to increase the effectiveness of their exploits. I guarantee that every time a list of passwords is released, someone uses the list to compile data for better password cracking programs. Nice analysis Colin, yet more conclusive evidence that password patterns are highly predictable. If only Sony had done the right thing and only stored hashes of the passwords rather than the passwords themselves, this analysis would not have even been possible! If we’re assuming that the attacker is trying to get one password, and not specifically my password, then I don’t have to outrun the bear… I just need to outrun the slowest person being chased by the bear. If that’s the case, it might make sense for me to restrict my random passwords to the letters, numbers, and characters which occur LEAST frequently. A random guesser will do no better, but a dictionary or optimized attacker will actually do WORSE against my password than against a typical password. Surprise! People don’t go through the hassle of memorizing a random string from a selection of 78 characters in order to register on a movie studio’s website. If only it was that simple. The majority of the passwords came with associated email address, telephone number and home address. Besides, do you really think that people don’t reuse passwords? Which password manager do you use? Or which do you suggest? I use last pass. It works under multiple operating systems and browsers. I now have a unique long password for almost every site that I visit. I often use shared computers and need to type my password every single time I log-in to anything. I also experience pain while typing. I can’t help but notice that a lot of the least used characters are characters that are more painful and inconvenient to type (capital letters, symbols). Yeah, I type unusual characters all the time while I’m working, but for some reason, it really burns when it’s in a password that I myself chose! You should send an article into 2600 about this.